Dagala Thousand Lakes trekking route is particularly rich in bird species, alpine flowers, musk deer and attractive meadows make this trek a wonderful experience. Dagala mountain range divides two prominent valleys of Thimphu and wangdi. 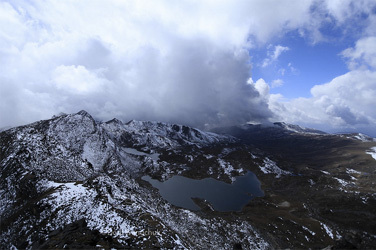 The altitude of the plateau is around 4000 meters. It has many lakes of different sizes and in most lakes one can find trout fish. The route also present fascinating views of prominent eastern Himalayan peaks such as Mountain Everest, Mountain Kanchenjunga, Jhomolhari, Jichu Drake, Masagang, Tseda Gang and Gangchhenta.. The plateau is also a grazing ground for yaks in summer. After breakfast drive to Thimphu. Lunch at hotel. After lunch visit Memorial Chorten, Nunnery, Handicraft Emporium and evening at leisure. Overnight Thimphu Hotel. Drive till Genekha Village, which is 40 kilometers from Thimphu where you will start your trek. Overnight in Camp at Genekha beside the river bank. Overnight Camp. Today's trek is all the way up till you reach the highest point for the day, Pagalaptsa 4,170 meters. From here you can see view of whole Himalayan ranges. From the pass, we hike down for two hour beside the Yak herder's camp, to your camp. Overnight Camp. A day's halt at this place will give a chance to visit many lakes around the place. Setso is the closest lake which takes only fifteen minutes walk. The rest of the lakes are further away which can be easily covered in a day excursion. A day's excursion will discover many lakes on the top of this mountain. Once you get on the top of the pass you can have the spectacular view of the surrounding mountains around during the clear weather. Today you have a gradual climb of 2-3hours to reach the Jomigue pass alt. 4,460m. From the pass some of the mountain of northern Bhutan can also be viewed. Then descend for about two hours to Jadula. Overnight Camp. The trail from Japhuna takes 1-2 hours through Rhododendrons up till the valley and Another 1-2hours to the lunch place. After another hour you will reach to the camp site Japhuna, which means a Rock Cave at an altitude of 3,800m. Overnight Camp. From Japhuna continue the gradual climb till you cross Jeleze La Pass at alt 4,000m. On a clear day you can get the a good view of Jou Dake Gang, Jhomolhari, Jichu Drake, Gangchen Tak, Masangang. After 2-3 hours gradual descend through the thick forest of blue pine and evergreen oak tree will reach you at Talekha monastery at the altitude of 2925 meters. Overnight Camp. Morning sightseeing of the Thimphu valley including the National Library, Memorial Chorten, Painting school and a few handicraft shops. After lunch transfer to Paro. Evening at Leisure. Overnight Paro Hotel. Drive to Paro International Airport. See off by our representatives.